Samsung has a successor for their U2 Mp3 player, the U3. 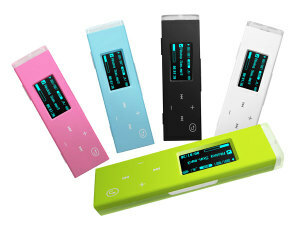 The 25mm tall Mp3 player, features a built-in FM radio, 4GB for you to store up to 1000 songs, voice recorder capabilities, record up to 33 hours of voice (ideal for keeping an audio diary or schedule) and it’s available in five colors: pink, green, blue, black and white. 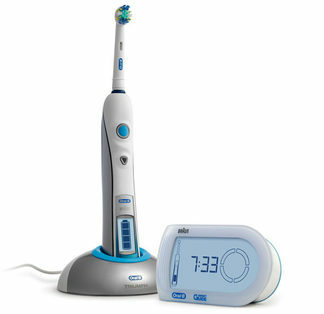 Another gadget for todays round-up is the 0ral B Triumph Toothbrush which features a ‘SmartGuide’ for proper tooth brushing. All your wisdom teeth can finally come into contact with a toothbrush. The smartguide can be placed on the sink , and it will let you know how long you’ve been brushing, and if you happen to gag, it will wirelessly communicate with you toothbrush and let you where to continue from. 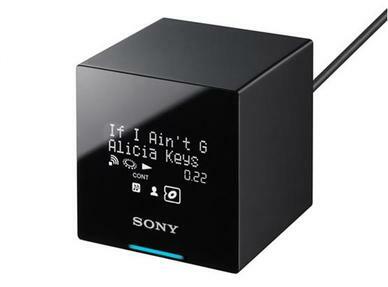 Sony's new Digital Media Port accessory, TDM-NCI cube, when connected to the BRAVIA's DMP lets you stream music from your PC to the home theater system through the home Wi-Fi network. It also features a bright digital screen that displays: title of the song, artist, duration of the track among other audio information.Its compatible with ATRAC, AAC, and WMA music files. Sorry Mac lovers, the cube is only compatible with PCs equipped with Windows XP operating system or newer version. Just like Hello Kitty and Pokemon, Gachapin is a popular Japanese character and Sony has launched a special edition Gachapin E-series MP3 Walkman. 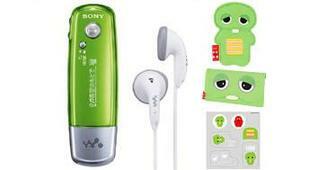 Available only in Japan, the Walkman is limited to 200 PCs for the 1GB, and 300 PCs for 512MB players. 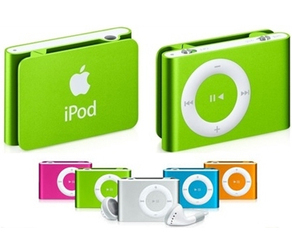 Its lime green in color, comes with a Gachapin shaped cloth case and a carrying pouch. Samsung’s new mp3 player, the YP-K3 which will make its official debut at the 2007 CES is the successor of the YP-K5. With the same glossy black color it features a larger OLED screen [1.8 inches], FM radio, up to 4GB and the same touch-sensitive navigation controls as the precede. Although the one thing that made the YP-K5 stand out is missing from the YP-K3, which is the slide out speaker. 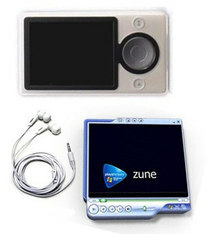 Buzz is building around Microsoft's most anticipated player Zune, I came across this two video clips, showing the Zune in action, one of the video shows how the buttons work, the other shows two Zune sharing music. Although the sharing is limited to 3 days or 3 tracks whatever the case...It has Wi-Fi, 30GB hard-drive, and rumor has it that, it has no wheel, instead it has five navigation buttons. Sony has launched this one-of-it's kind media player. Reports on Yahoo! News and Gizmodo, say the player will play MPEG-4 movies, music, and store photos on a built-in 1GB flash memory drive. You could also add more memory, of course, as the device has a slot for Sony's Memory Stick Pro Duo. The real purpose of mylo (my online life) is to connect you wirelessly so you can check your email, surf the web, send text messages through Goolge Talk or Yahoo!, make Skype calls, and anything else you want to do on the Web. The problem is the high price of $350, and the need for a Wi-Fi connection while you're on the road. The media player that looks a lot like a gaming device--mainly the PSP--doesn't have a digital camera, which would've been quite handy. Expect the device to hit stores next month.